Why one reporter’s photo keeps going viral a decade after publication. Nova Scotian shark, accept no substitutes. Just because it's on the Internet doesn't mean it's true. Unless we're talking about Carla Allen's shark photo, that is. 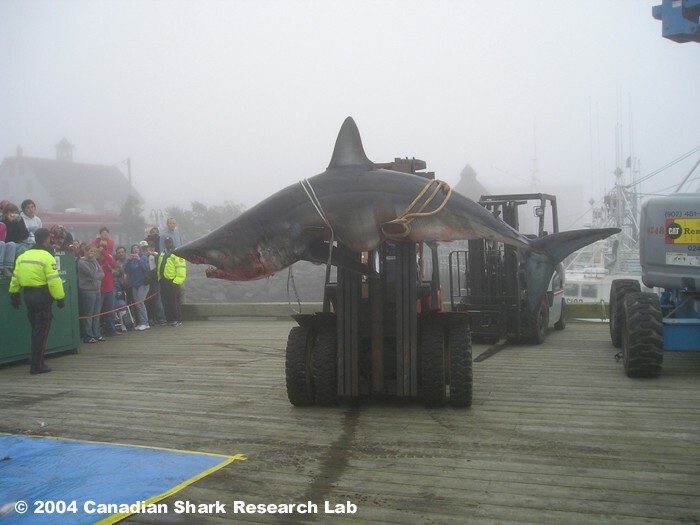 Earlier this week, Halifax’s Peter Lively shared a photo of a massive shark which he claims was caught off the coast of Nova Scotia. It's since been shared nearly 7,000 times. Some people are astonished, while other don’t believe it’s real. Is the “902” telephone number on the crane’s arm Photoshopped? The image is real, and it does show a three-and-a-half metre shark that was caught off the coast of Yarmouth. But anyone questioning whether it was a hoax can be forgiven, as the 2004 photo has a long history of false appropriation. In fact, the story of the photo is at this point more interesting than the tale of the shark it captures. Every year, Yarmouth holds its Shark Scramble event. Local fishermen head out to see who can catch the largest shark as a fundraiser for local charities and to provide research specimens to the Department of Fisheries and Oceans. Carla Allen, a reporter with the Yarmouth Vanguard, has been covering the Shark Scramble since 2002. She was there in 2004, when 28-year-old Jamie Doucette and his crew carried home a ten-foot behemoth. The female mako shark set a record that has yet to be beat. The article was filed, and Allen moved on to new assignments. But within a week of publication she started to notice her photos being spread around online via chain emails (this was pre-Facebook, kids); often without crediting the source. “It’s a real lesson in copyright,” she now muses. In the 11 years since being snapped, Allen’s photo has spread around the world countless times. 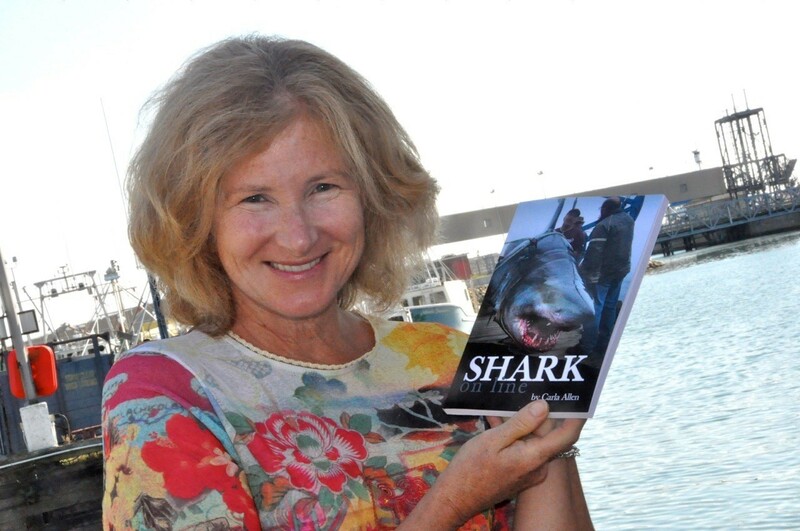 Someone, somewhere, will share her image while alleging a tale of massive sharks caught off their own local beaches. The story keeps repeating. Hundreds of locations have now stood in for Nova Scotia. Photo thieves have claimed sharks are terrorizing British Columbia, Alberta, Baltimore, North Carolina, Alaska, Texas, Arizona, Kentucky, Amsterdam, Australia, Sweden and South Africa (among others). Even a decade later, Allen says she sees the picture pop back up online and get shared about twice a year (usually around Shark Week). There’s even an online guestbook at the Yarmouth Magazine website, where G. J. LeBlanc collects messages from suspicious folks around the world who are trying to confirm the shark photo’s origins. Unfortunately, Snopes searches and viral photos don’t always translate to financial success. Allen says Shark On Line has in no way been a bestseller, but she did break even on it and is proud of her efforts. These days she still politely comments or sends off an email asking for credit whenever she sees her photo being shared online. The vast majority of the time everyone is happy to oblige. The labour to maintain credit for her work could be its own full-time job, Allen admits—a fact that has led to some gentle ribbing from those who know her. Teasing aside, it’s a hell of a photo. Allen deserves credit not just for taking it, but for making sure to spread the truth behind one awfully big fish story.